I have checked and TCP/IP is enabled and broadcasting on port 1443 according to Configuration Manager. The SQL Server Browser service is also running, which I read may be causing this type of issue if not. I have disabled my antivirus and firewall and that hasn't helped either. So what I am guessing happens is that even though Tedious lets you include instance name in 'options' it either doesn't use it or can't use it as it needs to be used. After doing some research, what should be happening is when you give SQL Server the instance name, it redirects you from port 1433 to the dynamic port it is using for that instance. I didn't know it was using a dynamic port, but if your instance is named the port will always be dynamic. I don't know where I saw it broadcasting on 1433, that was my mistake. All is good now, hope this helps someone. "...'Failed to connect to Server:1433 - connect ECONNREFUSED Server IP:1433', code: 'ESOCKET' }"
Check your SQL server version. In my case, I discovered that I could connect to SQL 2012, but not SQL server 2016 with the same code. It appears SQL Server 2016 is not supported by the tedious driver yet. Any changes made will be saved; however, they will not take effect until the service is stopped and restarted. I took this to mean, disconnect from the database service in SQL Server Management Studio and reconnect, but this needs to happen in SQL Server Config Manager under the SQL Server Services tab. Find you SQL Server instance, stop and restart it, and hopefully you will be golden! This worked like a charm for me. Oddly, enabling the Named Pipes protocol seemed to work without a restart (I could see the difference in the error message), so I thought for sure it had stopped and restarted as needed. 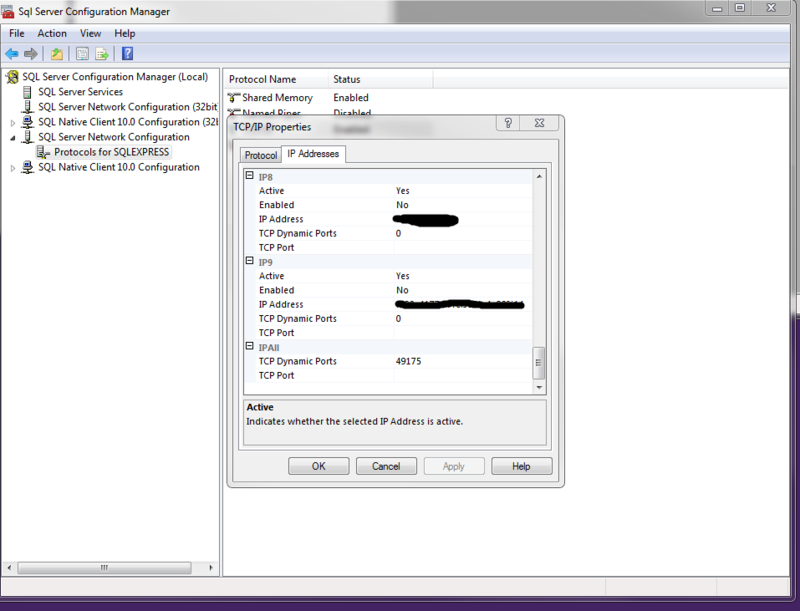 Also, be sure to enable SQL Server Browser services as well. This and enabling TCP/IP and restarting the service were the keys for me. If you still have problems after enabling TCP/IP protocol, I would suggest you check that SQL Server Browser Service is running. In my case I spent a lot of time till I realised it wasn't running.